Teachers have used our number beads as a fun and creative teaching tool and incorporated them in numerous activities including Pi Day which is on March 14 (3.14). 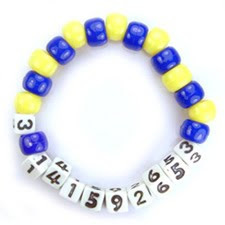 Use our numbers beads to represent the digits of PI and create fun bracelets as part of your lesson plan. The number beads are so cute and fun to play with that kids will love learning with them. This is a fun Pi Day project in which kids of all ages can participate. Creating your own Pi bracelets is simple, all you need are number beads, pony beads and elastic cording.